First we tackle news (16:44) on the Nolan Bushnell controversy, a revoked Dragster world record, and Paragon shutting down because Fortnite was just too popular. 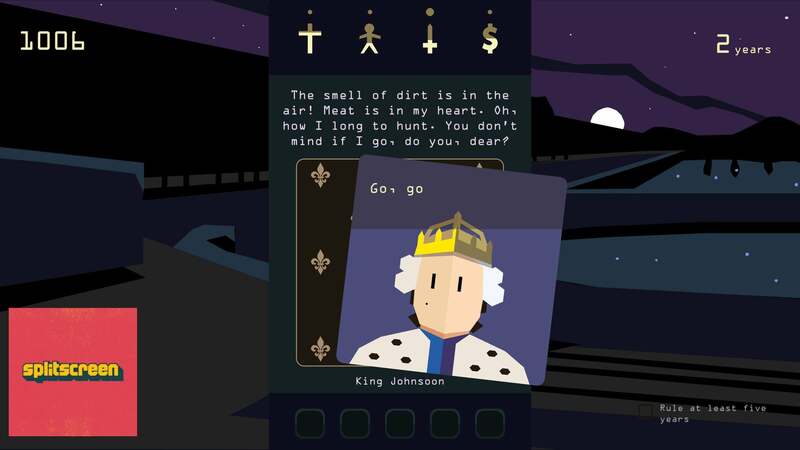 After that, writer Leigh Alexander joins the show (34:27) to talk about her work on the clever narrative game Reigns: Her Majesty, which is a Tinder-style swiping game in which you play as a queen making decisions as she tries to help rule her kingdom. We talk to Leigh about her work on the game, her evolution from journalist to video game writer, and the importance of tools in video game writing. Then, Kirk and I talk through some new games (1:05:00) including Monster Hunter: World and Celeste. Kirk: I think a lot of people who play games and think about game stories think of narratives in games as being sort of like a big story — someone writes it out like a screenplay. When in fact a lot of the time when you look at a video game script, a lot of times it's like a spreadsheet with notes in it, and there isn't like a big script. This game [Reigns: Her Majesty] seems designed specifically that way, because everything plays out in these modular vignettes. Almost everything conveyed by the script is like one or two sentences. Was that challenging? What was it like trying to write a story that has to be conveyed in this very bite-sized way? Leigh: Not a lot of people, even game developers don't always understand that the story isn't always a beginning to end thing. On a lot of the projects I'm on, people are like, 'Well what's the ending?' and I'm like, 'Well I want to explore it through the systems, I guess.' So yeah, it did kind of come together in an ever-tightening cluster. Kirk: Did you play the game a lot from start to finish? How do you get a feel for the flow when there's that much subtlety? Leigh: Yeah, I would have to play it constantly. Luckily [lead designer] Francois [Alliot] who's a technical genius was able to create a plug-in whereby I could update Unity directly from my Google Docs in real-time, so every time I could play the game, rather than have to put together a whole new build every time I changed something, I could look at stuff on the fly which was really convenient. Kirk: It's funny, we've talked about this a lot on the show, when we talk to developers, about tools and the ease of use and how important that is. This seems like, obviously it's a fairly simple game compared to some huge, triple-A complicated thing. But also that speed of being able to really quickly play it for you, especially as a writer, I'd imagine, rather than trying to write a story where you put it in and six months later you get it back and it doesn't sound how you wanted it to, and you want them to change it and it's too late. Leigh: Oh yeah, there would be times where I'd pour in big stacks of cards and you're like, 'I can't wait to see how these play,' and then you look at them and you're like 'uh-wha? No!' And it actually took me a while to learn the tools, because there's a language that it speaks with Unity that I had to learn to do. Before you have a grasp on the tools, you don't really know how you're going to express yourself through words. There was definitely a learning curve where I'd create a short alpha, and it would be terrible, and then I'd rewrite everything.